Ron Ayton Curtains & Blinds opened its doors on the Central Coast NSW in June 1986. Since then, Ron Ayton and his experienced team have been working with people on the Central Coast, assisting them to make the right choice with the furnishings of their windows with quality curtains and blinds. Ron Ayton Curtains and Blinds has a reputation second to none and can boast thousands of happy customers throughout the Central Coast. The aim of the whole team is to provide the right advice, best of quality and to be affordable. Our mobile showroom allows us to meet you at your premises and visualise exactly the look you are trying to achieve. By seeing your colour schemes, styles, furniture and fittings, we can provide expert advise on what would look great. 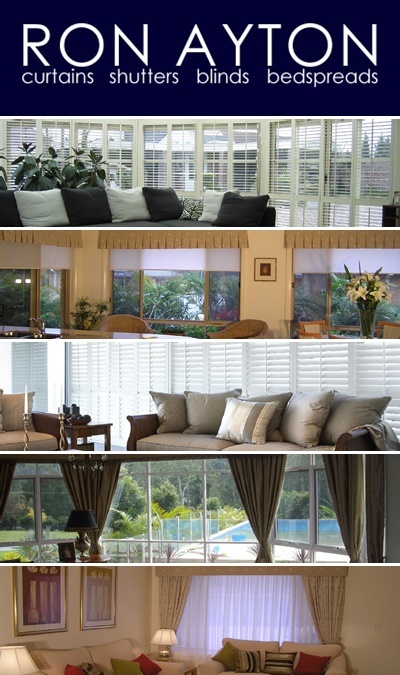 Our expertise is not limited to curtains and blinds as we are also specialists in shutters and bedspreads. Call us to arrange for a free measure and quote from our mobile showroom.